To save money and control moisture in your home through crawl space insulation, call the experts at DBS today! Our professionals are fully trained and certified to carry out work needed. We offer free estimates and serve Minneapolis, Superior, Duluth and nearby in Minnesota and Wisconsin. At DBS our team of in-house crawl space experts has just what you need to encapsulate your crawl space and keep it a warm, dry, and clean-looking place--one you won't mind crawling into! For a free written crawl space insulation quote at no obligation, call or e-mail us today! 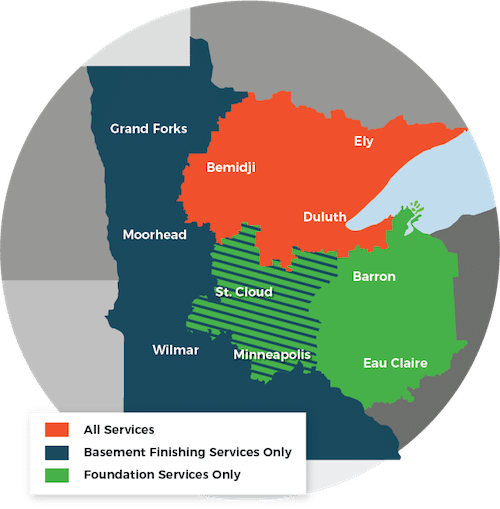 We proudly serve Cloquet, Two Harbors, Hermantown, St. Paul, Esko, Virginia, Ashland, and many other parts of Minnesota and Wisconsin.